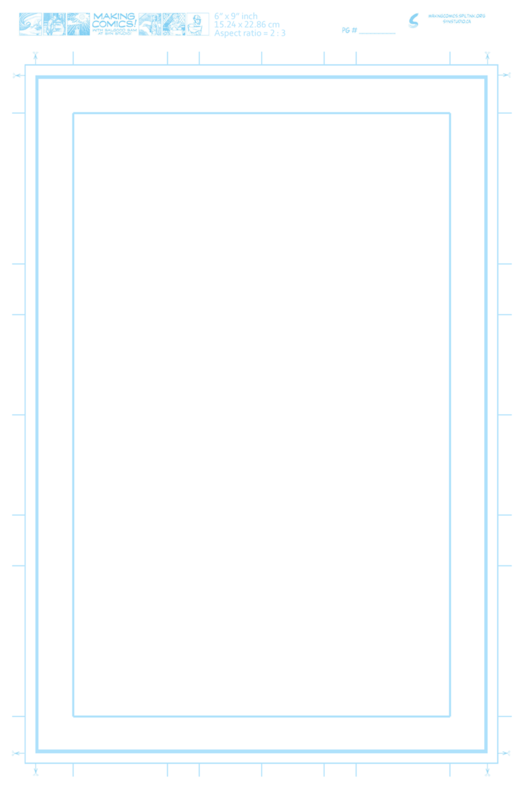 Planing a comics page out the first thing you need to do is decide what format will you publish it in, what aspect ratio or page size? Webcomic? That’s not totally standardized but something around 3 : 2 is about typical for I pad screens. Old newspaper strips were around 5 : 2 to 10 : 3? Graphic Novel [long form], Ero album, American pamphlet? Will your book be digital first or pint? 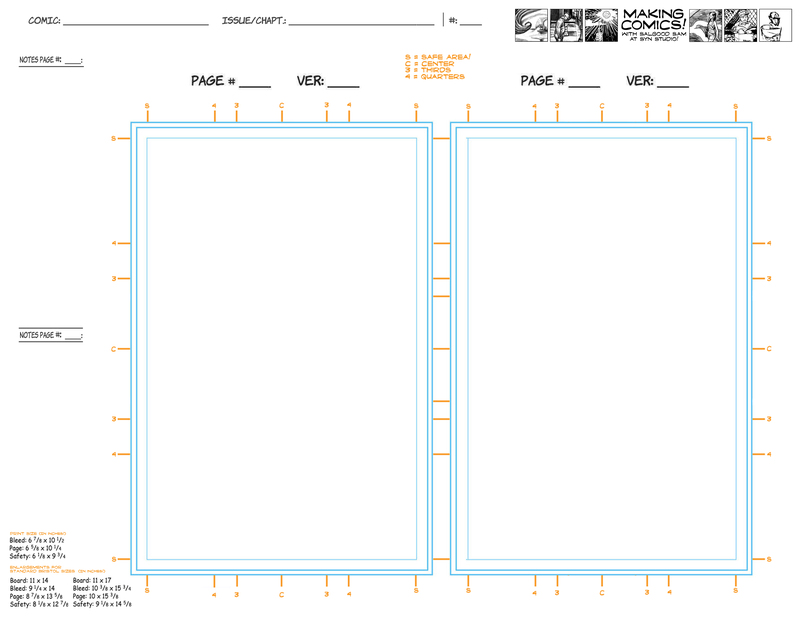 Standard American comics typically are printed 6.63″ x 10.24″ (16.84 x 26.01 cm). That converts to an aspect ratio of 663 : 1024! The exact measurements can vary a little bit, as you can see with the blambot guide here I found. But the aspect ratio is pretty much always the same! You can use this web based calculator to work out what measurements = what. Use a ruler to check some of the books you own and enter the numbers. European comics typically come hard bound, and 8.4″ x 11.6″ in (21×30 cm). That’s 21 : 29. But so would be 4.2″ x 5.8″ at half the size but the same proportions. See how that works? My book Dream Life is 8″ x 10″, 4 : 5! It’s a Trade. Trade Paperback graphic novels vary widely, there are a few standard sizes for Manga, Zines too. This is something we MUST resolve before we start drawing. So give it some thought. Factors to consider are how it will feel in the readers hands, how much density you can fit on the page before it becomes too small. And what’s available if you’re going to print it as well. For example both Kindle Direct and Lulu offer a variety of aspect ratio formats that overlap, they don’t all translate to the exact same sizes. For example my 8″ x 10″ Dream Life and Revolver from CreateSpace have to be converted to Crown Quarto, 7.44″ x 9.68″ before i can publish them at Lulu’s. Not quite a perfect match for 4 : 5 but i found it was the closest they really have at the moment. Most local printers will cut custom sizes but they may not all be priced the same. When you’re starting to think about printing it’s time to do some research and make some decisions. For our course, students work will be collected so it needs to conform to the same aspect ratio to fit properly in the Syn-Thology at the end! We’ve used a few in the past, to maximize the results for presenting the results at school and utilizing the tools we have there, we’ll use a 8.5″ x 11″ template from now on. That’s 17 : 22! You’ll find that below before all the others! Just print them out with your colour jet printer or at a local copy shop! 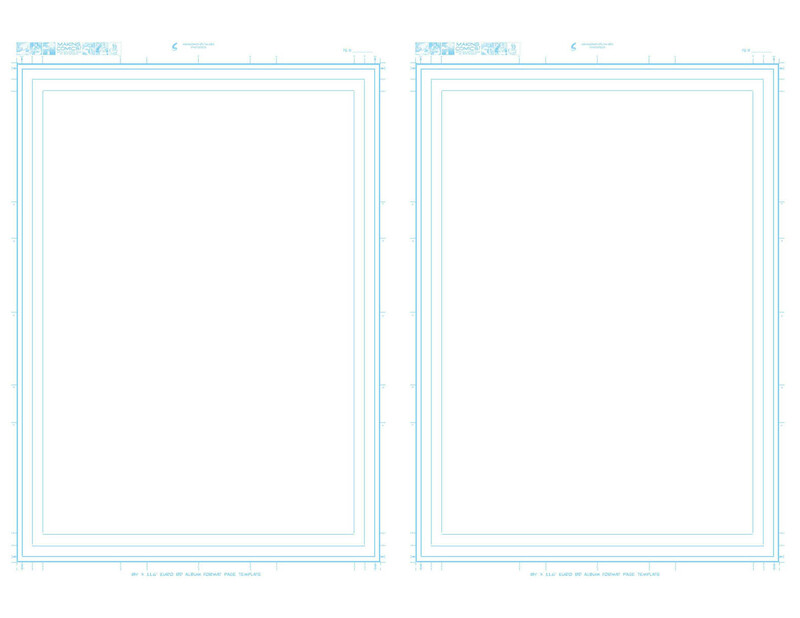 The measurements of each template are printed on the bottom of the large templates. On my templates, the innermost dotted area marked with an ‘S’ on the thumbs, is the “Safe Area”. In order to make sure it never gets too close to the crop or inner seam of the binding, no lettering or enclosed panels should normally fall outside this space. 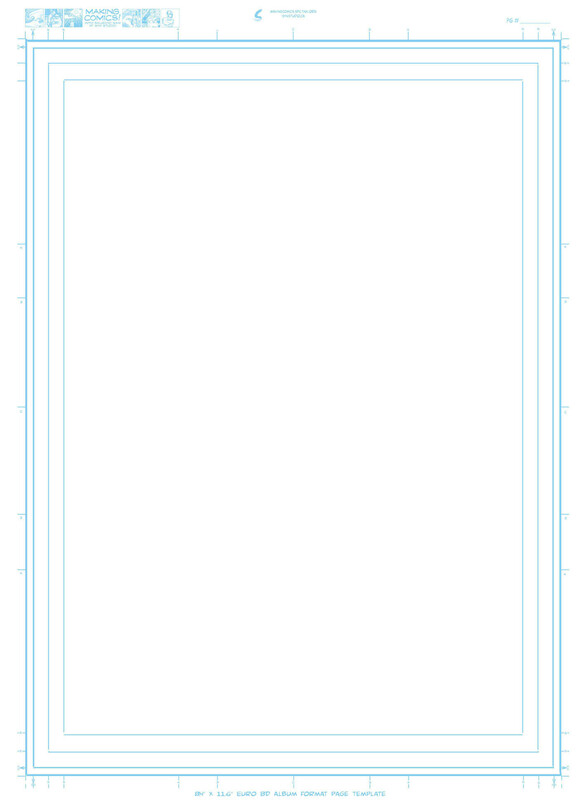 On the single page templates there is a second smaller “Safe Area”, it’s the same thing, just bigger margins, so that if you happen to like larger margins around your page, as I sometimes do, you can use that. The next line out from the “Safe Area” is the crop line. When the book is trimmed down after printing, this is where it will be cut approximately. Part of why the safe area is needed, is that the mechanical cropping is not always precise, and might vary by a fraction of a cm either way. The final outer line is the “Bleed” marker. If you draw things going off the edge of the page, it must go past this point! And for the same reason we have a safe area, trimming being imprecise, we want some extra “Bleed” in the art so it runs off the printed page properly even if the cropping is off by a bit. 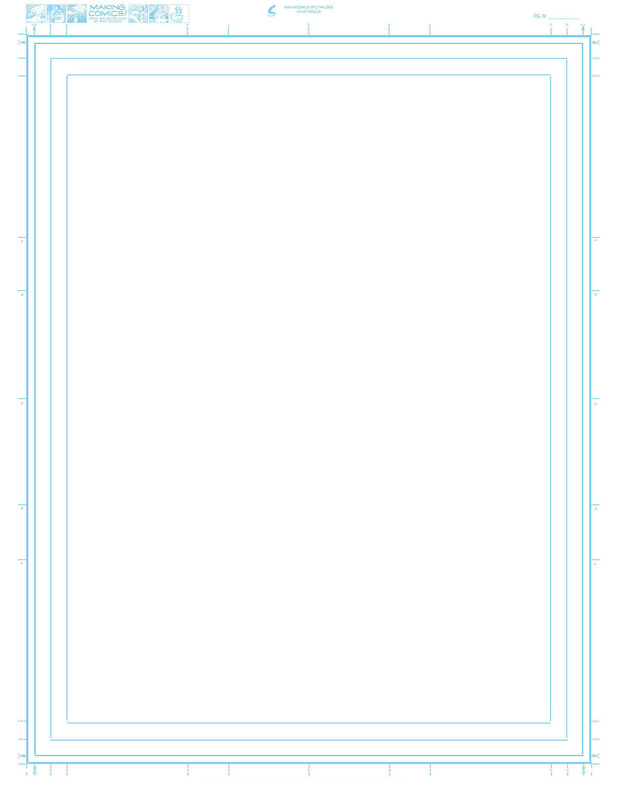 The thumbs include specs for alternate sizes to draw at, I myself seldom work at 11″ x 17″ anymore. But it’s still good to work larger than print size, to take advantage of how resizing the art for publication, tightens up our line and makes it often all look better. For our class, you’ll have a few option when it comes to scale, it’s possible to do a lot of the work on even just standard 8.5×11″ paper from your printer. But working larger will be possible too. We’ll get into the pros and cons of either in class. For a while now for a few reasons, this is the format we’ll use during the course. 8.4″ x 11.6″ Euro BD album format page templates! Most Belgian and European comics/BD are published in this format. It’s widely used around Quebec as well. And it provides for a bit more variety of page layout I think. it’s not quite as tall as the american comics dimensions, but often printed larger so really think of it as wider. Makes for great cinematic panels. and diversity in page flow. ED: It’s been a while since i made that but as I recall I found the measurements looking up online and cross checking against BD that I own, if you’re publishing with a printer used to the format check with them for their pref, but otherwise think it’s still fairly accurate? 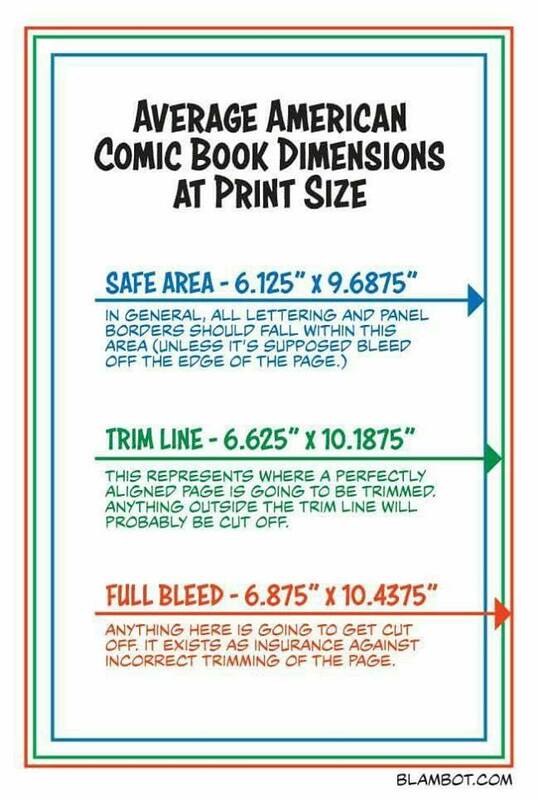 FYI for this and all the others outside of the US standard for which I own preprinted examples, I extrapolated the bleed and safe areas based on general printing averages. 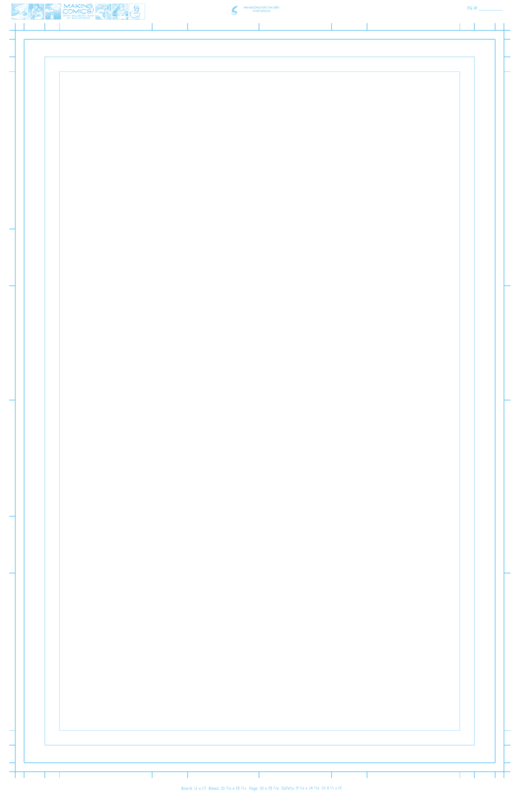 Bleed is always an additional 0.125″, or .25″ in total page width. And safe is about the same inside the crop line really but 1 cm or .5″ is typically about comic page margins but your millage may vary. I like using a wider margin myself. 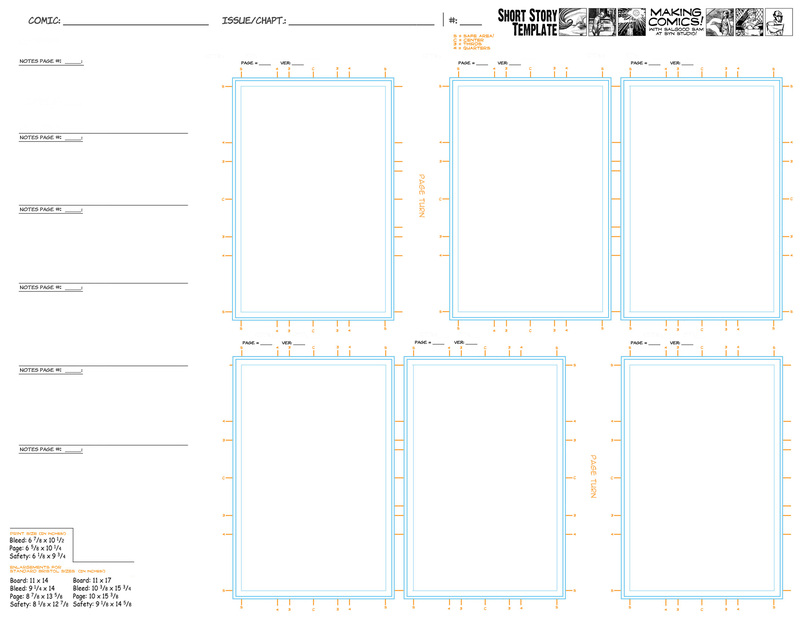 Thumbnail sheet – print these to do your rough layouts on. 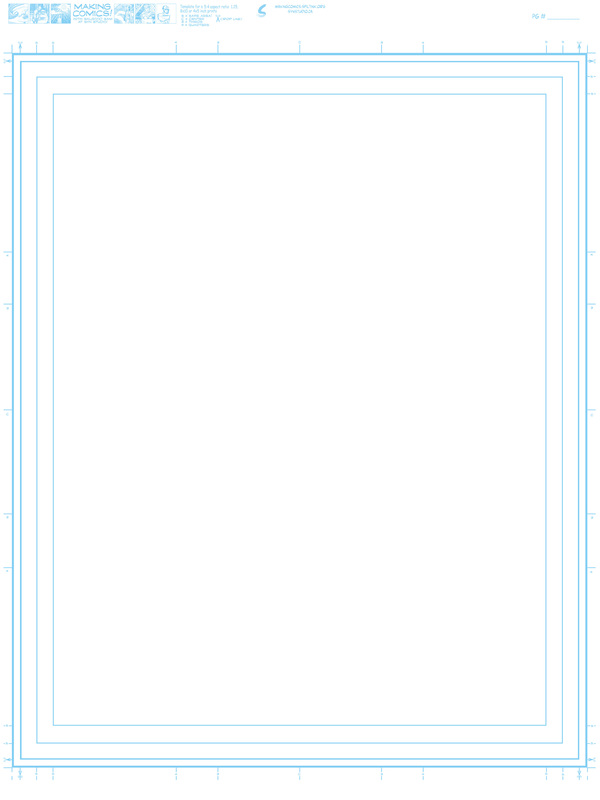 You can do roughs larger but this lets you see the over all page design and stay away from too much detail when you’re at the first draft rough stage. I used these printed out on 8.5×11 inch paper to do my ‘pencils’ on, printed on regular cartridge paper. They can be printed larger if you like to use them on a larger scale to pencil as many do. Right click [pc] or click and hold [mac] to save any of these files to your drive! US comics are tall and skinny compared to other formats. It’s an attractive aspect ratio, and the most common you see this side of the Atlantic. 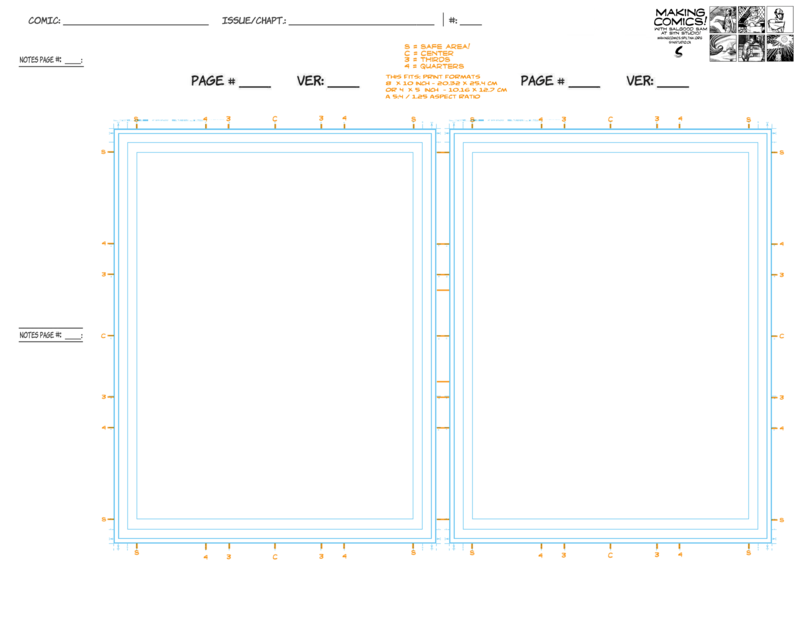 Full size Comics PG template – 11″x17″ at 300 dpi PNG file. In Making Comics we focus on short stories. This is both to keep the workload during a 10 day intensive course manageable, and leave room for other short exercises and Jams we’ll do together. To help facilitate that, here’s a 6 page thumbnail sheet, showing page turns and facing spreads, assuming a typical right hand first page. For a three page story just use the top row, the bottom is then handy for further notations. Thumbnails are ideal for visually writing the pages, resolving overall reading flow design, and the blocking of each shot without getting bogged down too early with the details of the art. The template is made to be printed on a 8.5″x11″ sheet in landscape mode, but if you want more room print it out on a larger sheet? the file is saved at 200 dpi. This is a common size for mid sized hardcover and trade paperback copies of novels. A good format for books that are ment to be sold to bookstores. The aspect ratio is: 2 : 3. 8″ x 10″ or 4″ x 5″ inch print format. many magazines and digests, some manga. A 4 : 5 aspect ratio. This is the size I use the most lately. Both Dream Life and Revolver are published in it. I’ve made both the thumbnail worksheet and full size template for this.